Okay, so it's currently 87 degrees in West Hollywood, which means I'm nowhere even close to putting on a pair of socks. But let's be serious -- how freaking adorable are the Living Royal Donuts Knee High Socks? You may remember when I showed you another pair of Living Royal socks I picked up a few months ago. (For a little refresher, click here.) I'm basically obsessed with every pair of socks this brand makes, because THEY ARE ALL SO CUTE. And socks printed with delicious-looking donuts? COME ON. Now, I know that these socks aren't fully pink. But most of the donuts are, so I think these count. 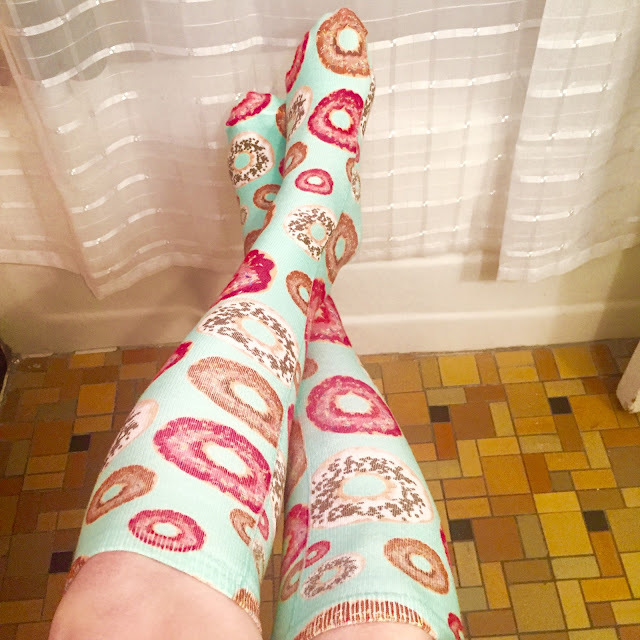 Really, the only bad thing about these socks is that those donuts aren't edible. The Living Royal Donuts Knee High Socks retail for $15 at livingroyal.com. Those socks are so cute. You crack me up. These are very very cute. But don't wear them on an interview! Those socks are the best thing! These are super cute! I love cute socks and these are awesome! Oh my gosh - I totally need one of those pairs of socks, stat. I have my eyes on a donut dress... I can't help but love how cute they are. Hilarious! These would be for me for sure. I just happen to be the queen of donuts (at least in my house)! Oh my goooooshhhhh these are so friggen cute!